Gordo arwork from Kirby: Triple Deluxe. Gordo (ゴルドー, Gordo) is a regular enemy in the Kirby series. A Gordo as it appears in Kirby's Dream Land. Gordos debuted in Kirby's Dream Land, and later reappeared in several games. They are completely invincible and act as hazards: some of them remain stationary, while others move in a line or remain adjacent to walls and floors. King Dedede throwing a Gordo in Brawl. Gordos can be thrown by King Dedede's side special move attack, Waddle Dee Toss, and also appear in his Final Smash, the Waddle Dee Army. The Waddle Dee/Waddle Doo/Gordo appears when thrown at a ratio of 35:10:4, which means there is an 8.2% chance of a Gordo appearing. They have very powerful vertical knockback,by far the greatest of the three, and they are capable of reliably KOing any character under 100%, even under 75% if not stale from repeated Waddle Dee Tosses. Unlike King Dedede's other minions, a thrown Gordo can be reflected back at the user. A thrown Gordo will bounce once, then disappear the next time it touches the ground. The Gordo is also unique as it behaves like an aerial attack in terms of priority: as such, a Gordo can collide with opposing hitboxes but cannot be canceled out. If it does come into contact with a hitbox that's within or above the priority range of the Gordo, the Gordo is not canceled out and it will continue along its natural trajectory while going through the opposing character without harming them. The Gordo is the only projectile in the Super Smash Bros. series to have this characteristic. Gordos that appear in King Dedede's Final Smash go at very high speeds, similar to the Waddle Dees/Doos, but are still less common, only appearing 1/4 of the time. A creature that sits in one place and doesn't even try to move. They won't even budge if Kirby tries to inhale them - they're the definitive obstacle. In addition, they're covered in spikes so they damage whoever touches them. They're found stopped in groups, blocking narrow passageways, etc. Nothing's harder to get by than an encampment of Gordos. A Gordo in Smash Run. 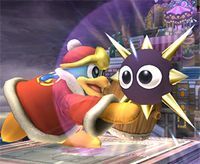 Gordos reappear in Super Smash Bros. 4 as part of King Dedede's moveset, being the only enemy thrown by his new Gordo Throw. Gordos also appear as invincible hazards. They either remain stationary or move in a set path, and can also damage enemies. The Gordo trophy is exclusive to Super Smash Bros. for Nintendo 3DS. 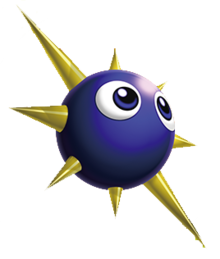 These little guys from the Kirby series look like metal balls with eyes and eight sharp spikes. They can't be defeated, so don't waste your time. Instead, try pushing your enemies onto them! Watch for two different kinds: one moves along a set path, and the other stubbornly sits in place. Gordos appear once more in Super Smash Bros. Ultimate in King Dedede's moveset, still thrown by his Gordo Throw. They can now also be inhaled by characters like Kirby and Dedede himself. Gordo also appears as a primary Spirit. In Gordo's spirit battle, you fight against 3 invisible King Dedede’s who like to use side special which is boosted during the battle. This is meant to resemble Gordo appearing from out of nowhere to attack you, thus he is technically fighting alone. Despite what the Brawl trophy description says, Gordos are able to move. The Subspace Army enemy Jyk is very similar to Gordo, as both are obstacles that are harmful to the players when touched, are indestructible, and are either still or move along a fixed path. This page was last edited on March 22, 2019, at 17:13.